I am extremely delighted to inform everyone that from this month onwards there will be two giveaways. The first giveaway as we already know is from Tarla Dalal, the second is a $60/ £60 gift certificate from CSN stores which are 200+ online stores and offer a large range of products right from console tables to dinnerware, cookware, home decor, furnishings and many more. To see more check here. Some pics of the products available with CSN. From now onwards the cookbook sponsored by www.tarladalal.com will be given only to the participants residing in India. In case participants from other countries want to win this book they should specify that while sending the entry and should be able to provide an address in India, in case they win. The CSN gift certificate is only for the UK/US/ Canada participants.The UK participants can order the products from the UK site. In case participants from other countries want to gift this giveaway to family or friends residing in these countries, please mention that while sending the entry and they should be able to provide an address where this gift certificate can be sent, in case of a win. There are no other conditions for entering the CSN giveaway except that you need to send an entry to this event. Please leave a link of the entry here in this page after you have sent it to the host, so that it’s easy for me to choose the winner. Coming to the event. The event for the month of October will be hosted by Preeti at Khaugiri and the theme is ‘Only’- Festive Food. One can check out the event announcement in her space here. 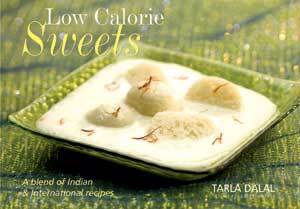 The cookbook sponsored by Tarla Dalal is Low Calorie Sweets. This book is a compilation of 43 delicacies to satisfy your sweet tooth, the low cal way. It includes both traditional Indian recipes as well as International recipes, and has been divided into distinct sections to help you choose the right dessert for the right occasion. The book is broadly divided into INDIAN SWEETS, which includes sections like Halwas and Barfis, Kheer and Phirni, Traditional Sweets with a Twist and Fruity Favorites and INTERNATIONAL SWEETS, which includes Fruit Delights, Ice Creams AND Frozen Desserts, and Choco Treats. This book is surely a treat for all of us who want to cut down on calories and still want to enjoy this FESTIVE SEASON.One can also order books from Tarla Dalal from here. If any of my friends and fellow bloggers want to host the event for next year, kindly let me know through mail to cookingoodfood@gmail.com. One can check the details of the event here. Nice. These giveways are perfect for the event. Great to hear about these giveaways Pari! We don't come under any of these countries. Dear Angie, I am sorry dear CSN is very clear that they can ship only to these 3 countries. Umm, u can always go for Tarla Dalal and provide me with an address in India, where I can send the book. Both the giveaways sound wonderful. Giveaways are very interesting.........all the best to the winner. Hey just sent in an entry ..Chk it out..
Hi dear,Just entered a entry.Pls do check.First time participating on giveaway.Hope i need correct. Hi Pari..here is my entry..sent to Preeti..